The Pros and Cons of this Beurer TL40 SAD Lamp. This Beurer TL40 Daylight Lamp offers a strong, reliable light source in an interesting little device. There are plenty of promises in the specification about the quality of the device. The first thing to mention here is that this is another medically certified option with the optimal 10,000 lux. Therefore, many users can be sure of the right light source for their condition. Added benefits here are that there is no risk of flickers and no UV. This increases the safety rating of the device, although there are some concerns mentioned below. Most users are happy with the ease of use of this Beurer SAD light box. This all starts with the clear instructions on how to use the lamp each day. All they have to do is sit around 15-20 cm from the light for the allotted time. 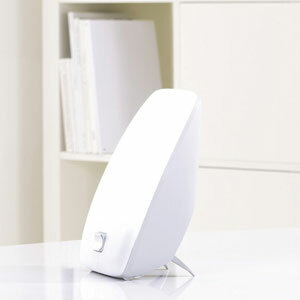 There is also the choice to use this either a desktop model or as a wall-hanging light, thanks to adaptations at the back. The former is preferable. It is compact enough for desks and night stands, can work well in an office and this set-up creates that optimal distance. Finally, there are also some great comments about the success seen with this SAD lamp, in terms of mood and energy levels in the winter. There are lots of great reviews for buyers that are glad they brought this lamp into their lives for the season because it helps to take the edge off. There are a couple of issues with this Beurer Daylight Therapy Device that users need to be aware of. The first issue here is the heat generated from this lamp. This is meant to be all about the light, not warmth. Yet, the power of the bulb and something within the electronics means that the base heats up far too quickly. There are some that have safety concerns here, especially when leaving this on a delicate surface. Some even make sure to use a protective plate each time. This added stress isn’t good for people with mood and sleep disorders. Some also say that the base starts to smell after long-term use. This shouldn’t be too big an easy after short therapy sessions. Still, this won’t add to a calming, pleasing atmosphere each morning. There is also a potential problem with a claim made. The company says that is can help alleviate the symptoms of SAD within just seven days, if used within the guidelines. This is perhaps possible for some people that use this every day at precisely the right distance. However, results depend on personal conditions. There cannot be a one-size-fits-all cure for SAD, regardless of the certification. Therefore, some people may get a little disappointed when it takes a little longer. What does this all mean for a final recommendation on this Beurer TL40 SAD Lamp? There is a clear problem that the designers need to rectify here. That issue with the heat and the smell of the base detract from the enjoyment of the session and add extra worry. There must be some way of changing the material, bulb or safety protections in the future. Otherwise, this is pretty good choice for people that want daily therapy sessions. The light source is clear, bright and reliable and does seem to have a positive impact on a lot of users. The shape is pleasant and compact enough for ease of use. 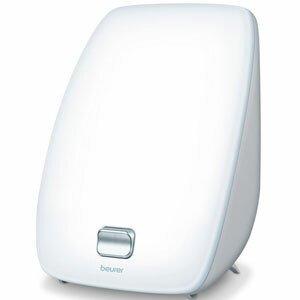 Therefore, this Beurer SAD light therapy box could be a great tool with a few alterations. Find more reviews about the Beurer TL40 Daylight Lamp on Amazon here.